I love the activity board. I want to build one for my son for Christmas. 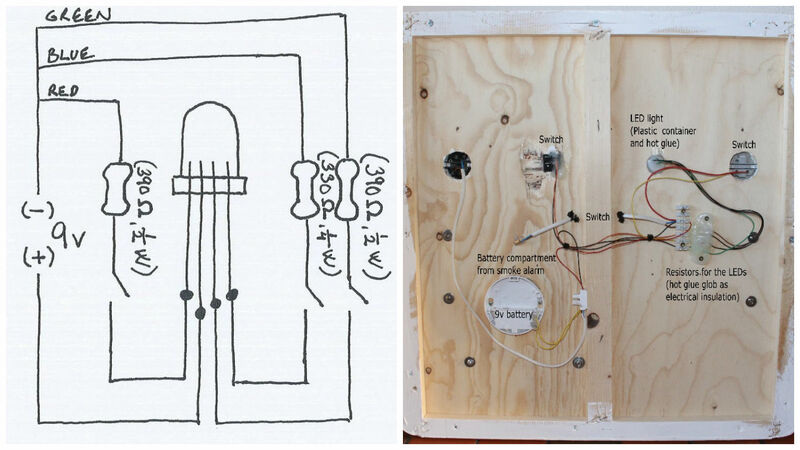 Where can I get the materials…resistors, bulb, switches. Thanks, glad you liked it. LEDs and resistors were originally bought off ebay from sellers in China. If however you have a deadline shorter than 4-6 weeks away (like say 24th of December) you are probably better off finding a local vendor of electronic elements and getting a few of each (in case something goes wrong during assembly). Smaller companies might even be willing to match the apropriate value resistors for you, taking out some of the guess work. I did it kinda backwards. I had a bag of RGB LEDs with unknown values (voltage and amperes) and a few different lower value resisters lying around, and basically experimented my way to a desirable led brightnes (resistor value) for each channel on the LED (red, blue and green channels have different power needs). Resistors can be added in series or parallel connection to give different ohm values (google: resistor calculator). Switches can be obtained from the same source as the other electronics, I got mine from an old Ikea lamp, a wall switch and an old piece of electronic equipment. If you havnt guessed it yet I like giving old salvaged parts a new life in things I build.